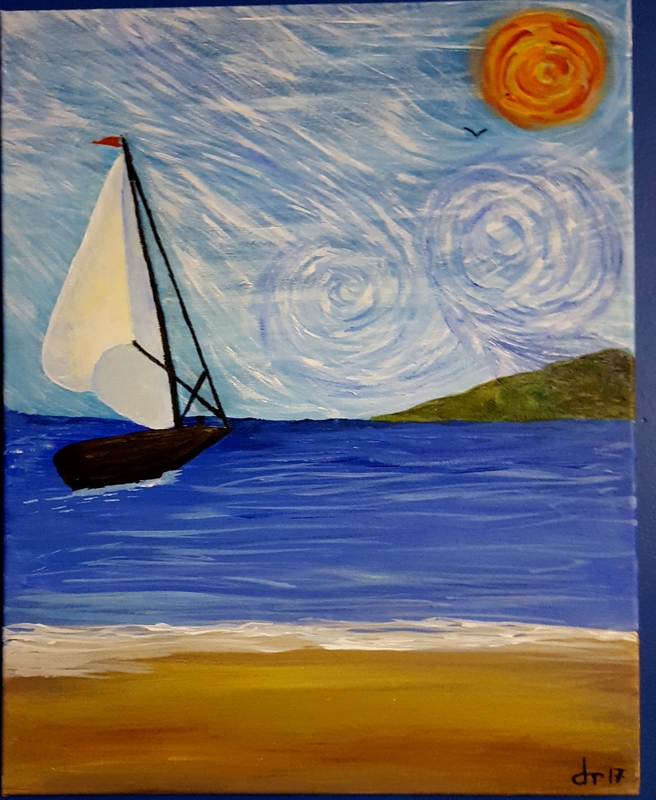 So fellow travelers, a while back I wrote about a creative adventure involving some Van Gogh inspired art for a good cause. Sailing with Vinnie the final version. A few of my friends commented on my project; one thing led to another and soon I was signed up for several paint events with various groups of friends at a local art studios. One session held at a small independant studio session had a distinctly different atmosphere from the Van Gogh fund raiser, which was held at a locally owned franchise studio. The concept of creating a painting in a casual setting was the same but participants could choose different paintings. The supervising artist walked around our stations giving us simple step by step directions for our chosen artwork. We shared snacks and beverages, chatted about our families, concerns about current events and joked about our not so artistic abilities. This last bit was one thing our studio host was quick to turn around. She would point out elements in our paintings that worked well, giving simple suggestions and encouraging each person to step back and look at their painting from a difference perspective. She gently reinforced the intention of working on different paintings is to minimize self-judgments and comparisions with others. Why do we demean our creativity so definitively? Artistic endeavors do not have to produce a masterpiece every time. Not one of the great artists through all the centuries could do that. Where is it written we have to be good at art to enjoy making it? We cut ourselves out of too many opportunities to try something new expectations of mastery. Still, I understand the tendency to be overly critical. This scene from the recent painting class sat on my easel at home for a couple of weeks until I adjusted a few little details that nagged at me. 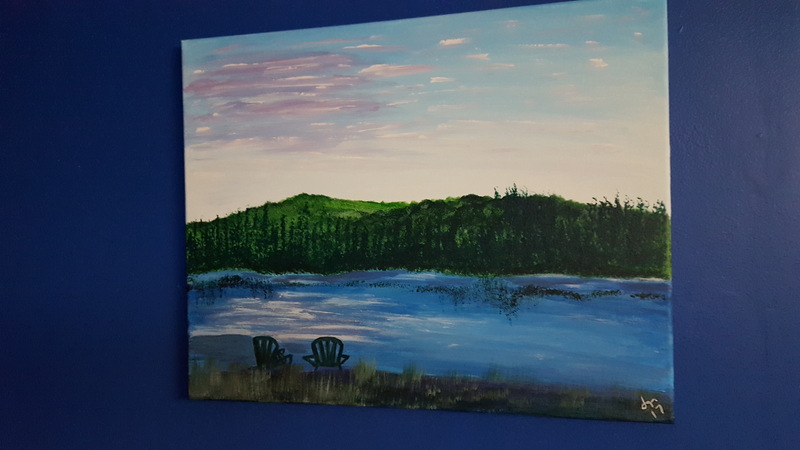 One of the Adirondack chairs looked awkward, there were some areas in the water where the color was off and a smudge along one of the tree lines that needed “erasing”. Thank heavens for the forgiving nature of acrylic paint. It’s been a little surprising to find how much joy I feel while painting. When my daughters were young I gave myself the gift of taking art classes for a few years. The busyness of life slowly encroached on my creative time and my art supplies were packed away for close to a decade. Coming back to the easel now I find, awkward smudges aside, the “masterpiece” syndrome holds less power over my process. Trusting my instincts of how a painting feels as it unfolds helps me tune out the voice of my Inner Critic. When my work looks right to me it is “good” art. 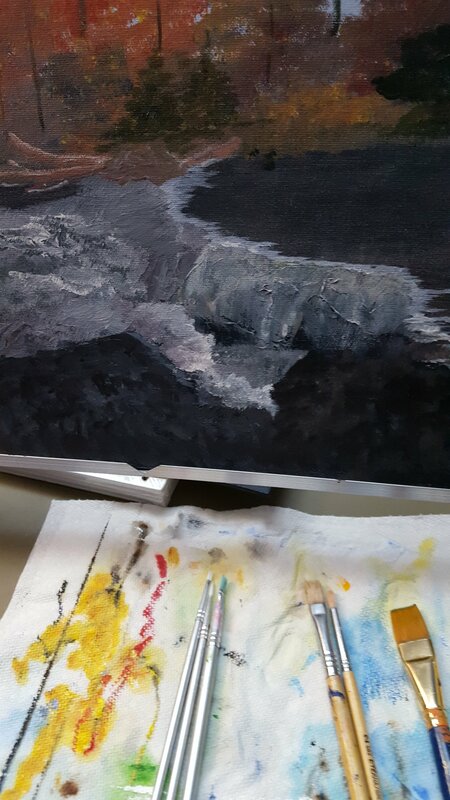 Inspired by the pieces I accomplished in the past few months, I’ve been grabbing little snippets of time to work on an unfinished landscape left over from my summer art class days many years ago. So now there is a stack of blank canvases in my art corner and the long days of summer vacation about a month away hold the promise of creative horizons yet to be sailed. I think most painters feel that way while they are working. I have a friend who is an avid working painter and she always finds flaws. Artists are most critical of themselves. It’s in our genes I think. Can’t wait to see what you paint!